When news came that the first Ebola patients were on their way to ELWA Hospital in Monrovia, Liberia, Nancy Writebol recalls feeling a surge of adrenaline. It was the summer of 2014, and concern about the gathering epidemic had been building throughout West Africa for months. Now the disease was set to arrive on their doorstep, since ELWA was one of only two hospitals in Liberia that could offer a makeshift isolation unit. Early detection and limited supportive care were all they could provide, Writebol told a packed audience of future nurses at the Glenn Memorial Auditorium on Friday for the 111th convocation of the Nell Hodgson Woodruff School of Nursing. As a clinical nurse associate, Writebol’s role would be to protect and decontaminate aid workers who were directly treating Ebola patients — preparing bleach water and taping down sleeves and gloves to ensure no skin was exposed to the virus, which at the time was nearly always fatal. Writebol considered her job in the “low risk zone.” And yet by late summer, she was exhibiting flu-like symptoms herself. She tested positive first for malaria, then later, for the Ebola virus. By the time she was taken to a local airfield for transport to Atlanta to be treated at Emory University Hospital, Writebol was too weak to walk up the steps of the plane. That is the face of a nurse, Writebol told the convocation audience. And just as Writebol found comfort in her care, she charged nursing students to offer the face of compassion to their own patients. 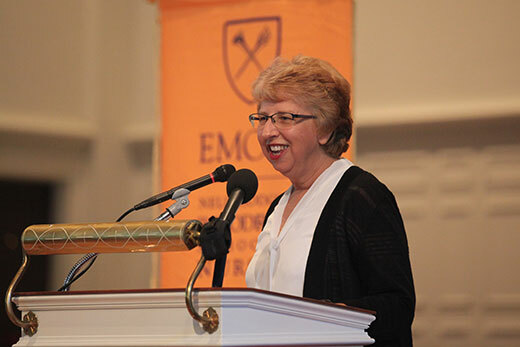 Convocation traditionally marks the beginning of an academic journey for Emory nursing students, and this year’s class is one for the record books, according to Linda McCauley, dean of the Nell Hodgson Woodruff School of Nursing. Two years ago this month, Writebol and medical missionary Dr. Kent Brantly arrived at the special Serious Communicable Diseases Unit at Emory University Hospital, where they would become the first people treated for Ebola virus disease in the United States. Reflecting back on that fragile time, Writebol offered praise for the lifesaving care she received at Emory through a team of five “superstar” doctors and nearly two dozen nurses, some who had cancelled vacations to help with her care. “It’s a privilege and an honor to be with you and to be once again at Emory University, this time standing and not on a stretcher,” she laughed. Writebol praised her care providers for assessing all aspects of their needs — “our bodies, our physical condition, our minds, and our spirits” — and addressing them as a whole. In many ways, that’s what Writebol did herself — pressing forward to be of service in the Ebola crisis at a time when many were fleeing. She recalls some Liberian hospital workers who refused to don protective gear and treat Ebola victims, who were kept in a makeshift isolation unit they had created in a hospital chapel. At times reading from her journal, Writebol described how the crisis that would eventually capture worldwide headlines began quietly in a village in southeastern Guinea with the death of a 2-year-old child in December 2013. By March, health workers had alerted the Guinea Ministry of Health that a problem was building; Doctors Without Borders were warning of a mysterious disease that caused fever, diarrhea and vomiting. The World Health Organization (WHO) would eventually confirm that the outbreak was linked to Ebola, a hemorrhagic disease that typically led to death. Later, the WHO would call the Ebola outbreak in Western Africa among the worst in world history. The disease ultimately claimed the lives of more than 11,000 people and infected thousands of others throughout the region. In her address, Writebol suggested that might actually be a conservative estimate. Many people who sought help at the time were turned away due to a lack of space and resources and returned home to die, she said. Reading from her journal, Writebol recounted the day the first Ebola patients arrived at the ELWA Hospital. They included a man, already deceased and showing signs of rigor mortis; a woman, so anxious to be away from the dead man that she lay on the ground outside the ambulance in the rain; and a child. Today, Writebol has returned to live and work in Liberia; if anything, surviving Ebola has given her the wisdom of first-hand experience, which now informs her care-giving. In partnership with Samaritan’s Purse, ELWA has pledged to dedicate a new hospital to serve the people of Liberia. Plans call for it to include an isolation unit, “one that looks as if it would come from a first-world country,” she said.